This tip is probably old news for most seasoned Mac users, but passing it on for people who may not know, and so I can link to it with other posts at some point. Ever since the first PowerPC based Mac desktops with more than 1 CPU existed, there has been a small preference pane included in Apple's Developer Tools for Mac OS X you can install that allows you to disable multiple CPUs or CPU cores on the fly from your Apple menu bar, or from System Preferences. For desktops this is useful for cooling purposes when you don't intend to do much processing, for notebooks you can save battery power (most of the time) by only running one CPU core. If you already have the Developer Tools installed from your Mac OS X installation DVD, navigate to /Developer/Extras/PreferencePanes/, double-click on Processor.prefPane then choose whether you want every account on the machine to be able to use it, or just yourself. For the former you'll need to provide an administrator's credentials. Once it's installed, you'll have a processor icon on your menu bar which you can use to turn off some of your CPUs or CPU cores. 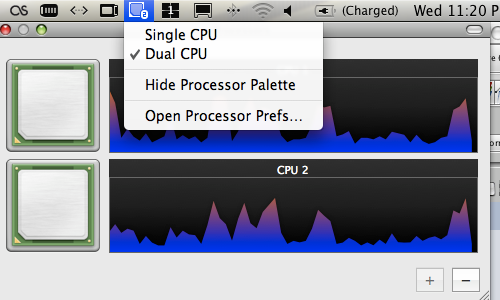 You can also toggle a fancy "Processor Pallete" which shows a histogram of CPU usage.